Click here to view a larger version of the above table. Originally shown at the United Nations headquarters in New York, and previously exhibited in Kuala Lumpur and Sarawak, the exhibition were held for the first time in Penang. The exhibition promoted the common ethical values which can be the basis of peace and dialogue amongst the world's religious communities. One common principle is the Golden Rule "Treat others as you like to be treated", variations of which are found in all religions. 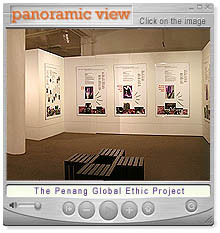 The exhibition was made available in Malay, English and Mandarin. The English version was exhibited at the Penang Municipal Council Town Hall in Esplanade, the Bahasa Malaysia version was at USM ABN Amro Arts and Culture Center in Beach Street and the Chinese version was at the Alpha Utara Gallery in China Street.  Click here for Bahasa Malaysia version of the exhibition at USM ABN Amro Arts and Culture. For a panoramic view of the gallery click on the images below. the Penang Municipal Council Town Hall in Esplanade.  the Alpha Utara Gallery in China Street. The world famous Austrian story-teller Tegetthoff shared stories from his book Tales from Heaven (2002). Tegetthoff is the organiser of Europe's biggest story-telling festival 'Tales of Graz', and the author of 31 books which have sold a total of 1.4 million copies. His visit to Penang was made possible by the Austrian embassy. The winning entries from the first ever Arabic and Chinese calligraphic competition on 'The Golden Rule' held at the Islamic Arts Museum in Kuala Lumpur in 2005.  Click here for Calligraphy exhibiton at Dewan Sri Pinang. This art competition was opened to primary and secondary school students in Penang. It was divided into 4 categories with the theme  "Seeing Unity in Diversity. The event was organised by the Penang Teachers' Art Circle. Winning entries were exhibited at Dewan Sir Pinang in Lebuh Light. Malay  available on request. Walkabouts which encourage discussion and sharing of knowledge about the history, heritage and values represented by landmarks and places of worships along the Street of Harmony. Each tour lasts 2½ hours. Additional tours are available upon request. To register call Penang Heritage Trust at 604-264 2631. Trails which are specially designed for young people, with hands-on activities such as interviews, information hunts, group work, documentation and interactive learning of skills such as making of songkok, flower garlands and joss-sticks. To register call Penang Heritage Trust/ARTS-ED at 604-264 2631.